"I just like fighting. Everything else is too boring." Sometimes, a cop needs something besides and axe to get the job done. That would make an axe cop potentially even more effective at saving the day and protecting innocents. Why not throw in some other axe-wielding companions for good measure? 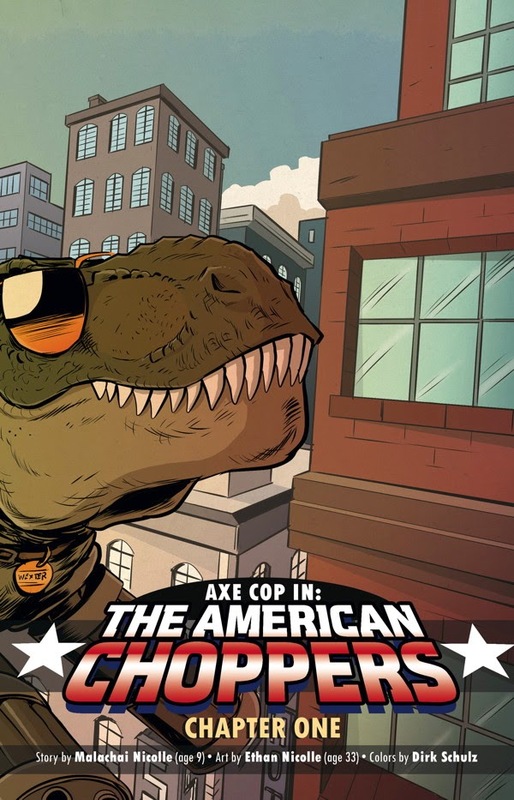 Dark Horse agrees and offers up Axe Cop: American Choppers #1. 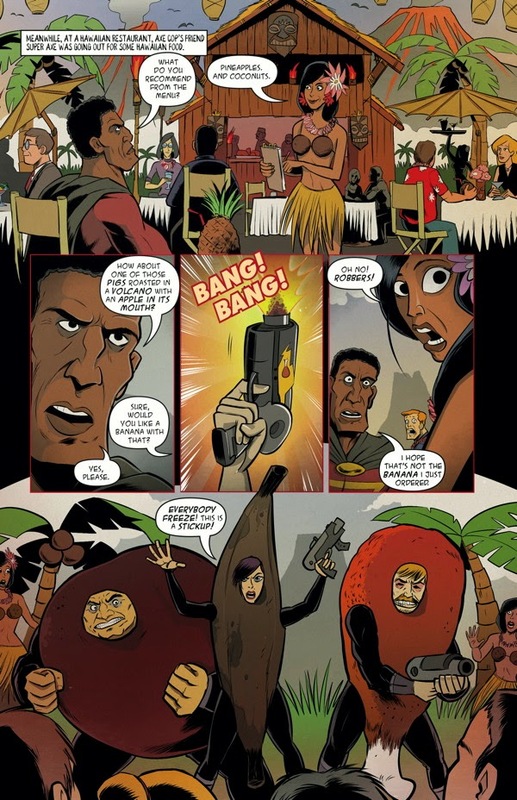 The issue is written by Malachai Nicolle, illustrated by Ethan Nicolle and colored by Dirk Erik Schulz. 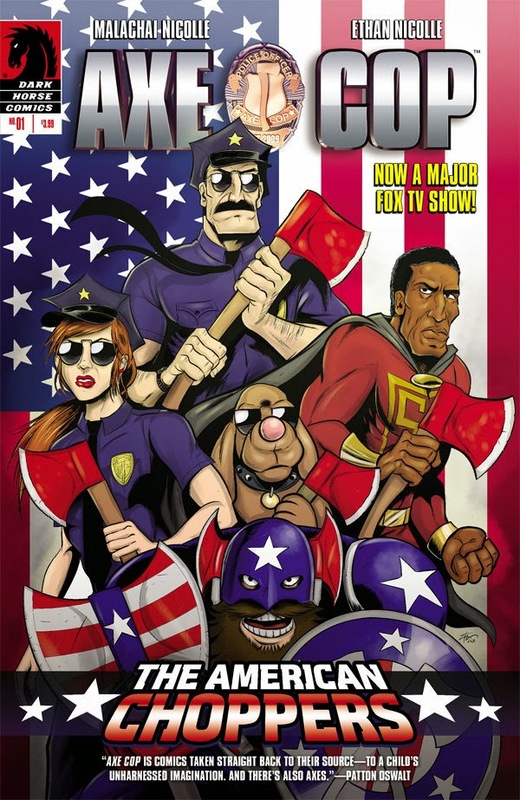 President of the World Axe Cop reunites with Super Axe, an old friend from college, and the two of them decide to start a superteam of axe-wielding heroes to defend America, called the American Choppers. They are joined by Captain Axe, Axe Girl, Axe Woman, Axe Dog and other axe-wielding heroes. The only problem is that there are no bad guys left, but that all changes when mysterious giant creatures attack the city. 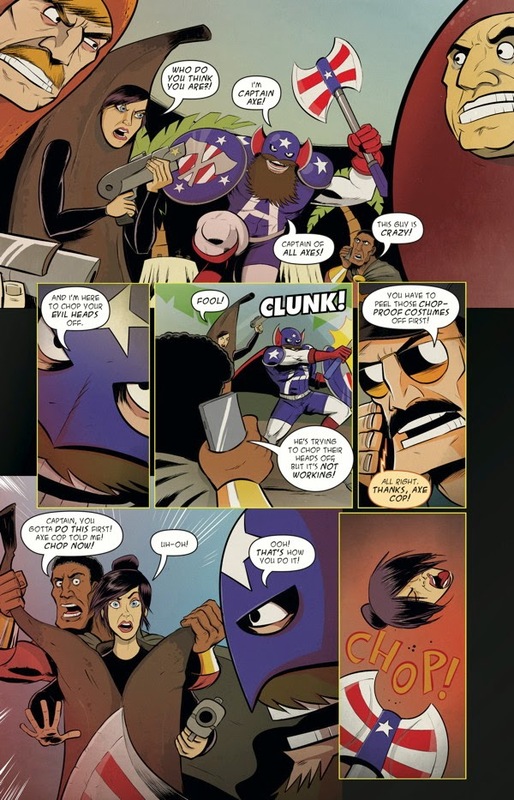 There's something to be said about the imagination of youth and Nicolle definitely nails it in Axe Cop: American Choppers #1. Of course, it helps that he's a youth himself and the book definitely reflects that largely through the relative zaniness thrown in Axe Cop's way. Axe Cop himself is as belligerent as he is interested in saving the day, viewing others helping him as friendly competition in saving the day. The enemies include the Food Force Three, who are three individuals dressed as different foods and a hunger for crime. Scenarios like that seem rather ludicrous, but work for the book. There's a frenetic approach to the art by Nicolle that accentuates the script. Some of that approach gets to be a little overwhelming at times, as there are some pages where the panels seemingly cascade atop one another. The characters are illustrated with clean black lines and are very angular in appearance. They carry a superhero pedigree in looks that helps remind the reader what kind of book Axe Cop: American Choppers #1 is at its heart. He also does a great job with all the other insanity illustrated in the book, including things like patriotic missiles, aliens with toothy tentacles and ATV RVs with wings. 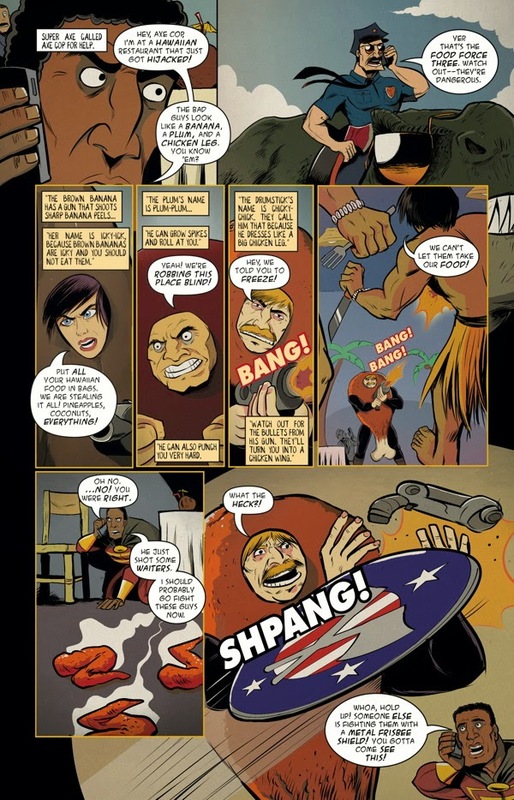 If you're looking for a book that's pretty crazy and enjoyable, then Axe Cop: American Choppers #1 is the book you want. The duel Nicolles are definitely in sync (presumably since they're brothers) and the play off each other very well. The issue is the first of a three-issue miniseries that looks to wrap up pretty neatly, but it's going to have a fair share of madness along the way. Axe Cop is a character who's a little uneven overall, but delivers as a man who wants to be a hero and is very good at being a cop with an axe. 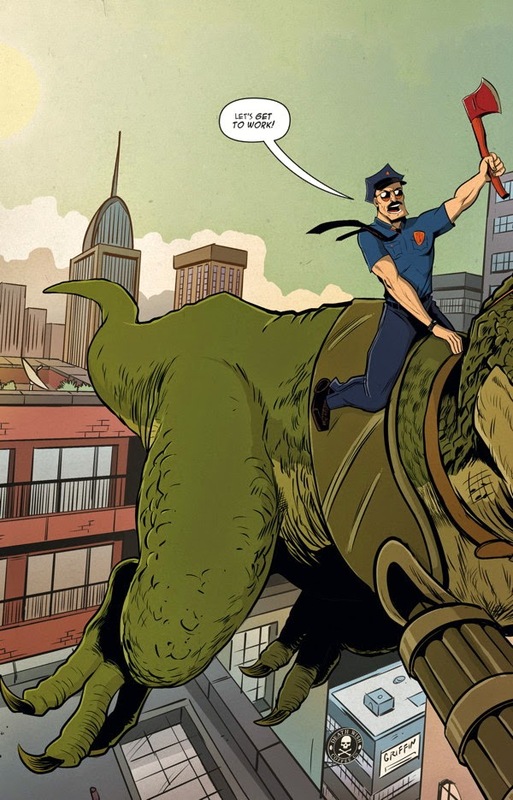 The book is really light and enjoyable and if you like the thought of a cop riding a Tyrannosaurus Rex, then Axe Cop: American Choppers #1 is the book for you. 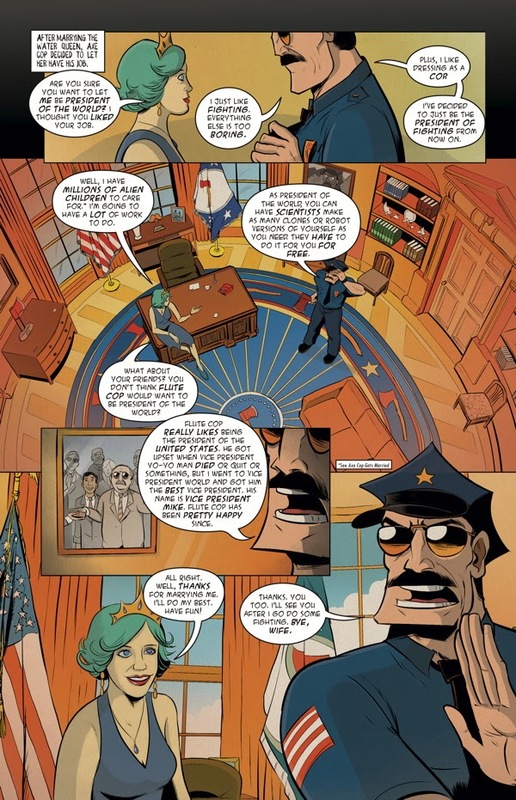 Axe Cop: American Choppers #1 is in stores May 21 with interiors below.